You can bring information about your product to your customers in many ways. For example, you can create a knowledge base, ebooks, white papers (by the way, our CEO wrote about it on his Medium blog). This time we decided to focus on the knowledge base. Knowledge bases are well suited solely for complex products. Academies are more universal because they can be applied to the products of any complexity. Moreover, you improve readability of your content by splitting information into parts — lessons and courses. Well, there is no interaction with a knowledge base. Users, in fact, simply read your text. There are no tests, and they wouldn’t spread information about your knowledge base. Who would ever share a knowledge base? On the contrary, Academies can be easily shared. Furthermore, learners can share courses and certificates. It is one of the coolest things about Academies (and an extra point). This point is closely related to the previous one. 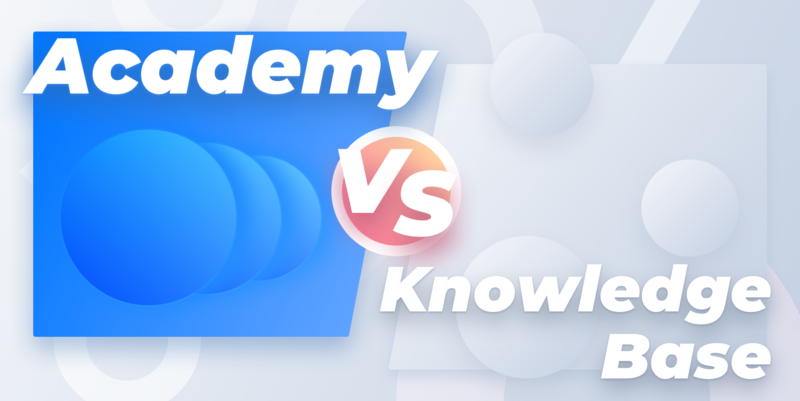 As long as learners have many points of interaction with Academies, it allows you to have detailed statistics on each reader, for example, amount of lessons they’ve learned or time spent in your Academy. Knowledge bases really lack this powerful statistics. Knowledge bases are boring, let’s be honest. A lot of dry text, no step-by-step flow, lack of visual components, no quizzes, no awards… That is what Academies do have enough of, making educative content about your product attractive. Yes, don’t forget about “novelty”: knowledge bases are just a little bit younger than guest books. While Academies are a modern technology which appeared a few years ago. People usually turn to knowledge bases when they need to get a clear answer to well-defined questions. This means knowledge base is a response to “HOW”. Academies consist of structured and interesting content that provides broader explanations. They answer both “HOW” and “WHY”. Sorry, knowledge bases, this point is for Academies. The “HOW” and “HOW and WHY” principles influence the amount of time a user spends on your website. If a reader got stuck in knowledge base, it means that he got some troubles. Either he has a very complex problem or a text is hard to understand. This is why knowledge bases have nothing in common with marketing. Academies are the opposite. The more time learner spends in it, the better it is. Why? Because your learners interact with your content to become masters of your product, and they turn into loyal customers. Academies are useful not only in customers success, they are your powerful marketing tool. Looks like Academies score one more point. Though, in fairness, it makes sense to have both an Academy and a knowledge base if a company has enough content and a complex product. A knowledge base, in such a case, would serve as a repository of information. While Academies can be used as a tool that turns visitors into loyal customers.